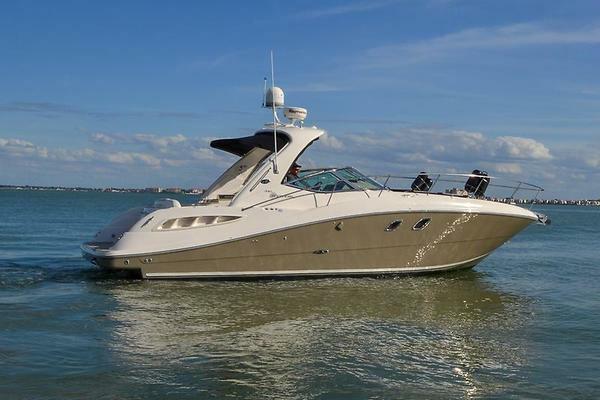 Fairline Targa 50 GT in mint condition and fully equipped! She can accommodate 6 guests in 3 cabins with 2 bathrooms plus a crew cabin. Her modern interior is cooled by tropical air conditioning. Targa 50GT - another benchmark is set The introduction of this dramatically styled and feature-packed new Targa for the 2010 model year is another fine example of how intently we listen to our owners and how skilfully we interpret their ‘wish lists’ to deliver the boat they really, really want. Our new 50-footer will be the very latest evolution of the hugely successful Targa concept, embodying all the many advances and strikingly practical design elements that have won this long range sports cruiser line-up so many friends- and awards - over the years. Quite apart from her stunning look and stylish lines, perhaps the most immediately striking feature of this latest design will be the light, airy atmosphere created by the use of panoramic windows and extended glazing throughout the boat. The feeling starts in the saloon where, even with its cleverly engineered sliding roof closed, the massive windscreen, long, deep side windows and flush glass entrance door help create a welcoming, light-filled space for relaxed living and entertaining. This ability to have your living space fully open or fully closed is one of the delights of the Targa GT concept. It’s the same illuminating story below, where the central foredeck and panoramic hull windows flood the spacious accommodation with light. Talking of which, the class leading master cabin with its large en suite, has the feel of a much bigger boat, thanks to the open, airy layout utilising the full width of the hull. Equally luxurious are the two twin guest cabins, both of which can be swiftly converted to provide double beds. As you might expect from Fairline, the design brief for this fabulous boat included “maximum luxury and convenience for owners and guests” - which, in summary, means sumptuous accommodation for 6 people, a comprehensively equipped galley at saloon level and a fabulous cockpit with masses of space for entertaining, sunbathing and relaxing. The extra-large, safe bathing platform has twin access points, as well as the options of a tender launch system, separate passerelle and powered bathing ladder. Oh, and a rarity on a boat of this size, a superb crew cabin - or lazarette - option. You can cruise further too - class-leading fuel and water capacities give this Targa an unusually long range capability. The Targa GRAN TURISMO concept has already proved to be a winner with discerning owners the world over, combining the superior, smooth-riding performance for which this award-winning line-up is renowned, with unmatched standards of craftsmanship. The new Targa 50GT looks set to raise the bar still higher.